Observant FORCE readers would have read Executive Editor Ghazala Wahab’s Read, Reflect, Repeat First Person column in the January 2018 issue with delight and a sense of déjà vu. In her prescient take, she pithily observed not just a decline in the reading and reflecting habits of officers, but, more worryingly, the unexpected, cavalier attitude of a few senior officers towards this decline who disparaged it as an issue of no consequence. The February 2018 FORCE issue set a precedent by publishing overwhelming reader support for Ms Wahab’s insights and concerns and reinforced her take that such institutional absence of intellectual underpinnings in officers and its informal acceptance may not bode well for the military if left unchecked or glossed over. Such deep-rooted concern about this and many other indices of apparent institutional mindset in the selection, training and education of young officers is also the subject for veteran army officer Col Vinay Dalvi’s Beyond the Victory India Campaign: Articles and Debates by Military Veterans, a well produced effort of Pentagon Press, Delhi and his fourth book in his ‘Victory India’ series since 2013. The series focuses on identifying deficiencies in and setting things right in the ‘cloaked in secrecy’, little understood or openly discussed military selection-training-education domain which is exclusively and inexplicably steered not by the military’s HQ Integrated Defence Staff (HQ IDS) but by an inaccessible civilian scientist dominated and led Defence Research and Development Organisation (DRDO) Laboratory; the Defence Institute of Physchological Research, (DIPR). This establishment, much to the chagrin of the military, routinely takes minimal inputs from the military (represented in innocuous junior or medium level positions in its establishment) while conceptualising the selection/training/education or modifying the domain to meet current and future military challenges. It has been defending the vintage selection/training norms handed over on Independence and justifying them with obduracy even as the originators, the British, have long since discarded their norms and created new selection norms in line with current realities. Dalvi and his Victory India Team write with frankness, insight and pedigree on what in this opaque DIPR system needs correction and how, backed by substantial research and international bench-marking. If taken up, these suggestions can lead to qualitative military officer improvement to handle current and emerging challenges in the increasingly complex Indian security environment which has mind-boggling external and internal dimensions. Beyond the Victory India Campaign: Articles and Debates by Military Veterans is only superficially a compendium on the vital issues that concern the gamut of Indian military officer quality. It is more pertinently an impassioned plea to move away from legacy methods of selection, training and education of India’s military. These methods were hastily and rather thoughtlessly copy-pasted by the British military hierarchy from German selection methods for inducting the vast swathes of ‘allied’ and British officers it urgently needed on the onset of World War II. Dalvi makes the point that these methods remain largely unchanged and opaquely institutionalised over the last 75 years but for some pedestrian tinkering such as has recently been initiated to deflect persistent criticism of prevailing systems. He suggests that this mindset is at odds with emerging realities where officers must learn to ‘think-on-their-feet’; be multi-skilled, alert, aware in real time, driven by instant ‘situational awareness’ and decision-making skills (almost always at junior levels as occurred recently at Kupwara, when fire had to be opened by the military to save military personnel from mob lynching) besides possessing the timeless qualities of good officership unchanged since the Battle of Megiddo in the 15th century BCE; since the Battle on the Hydaspes (Jhelum) in 326 BCE between Alexander the Great and Porus: officer like qualities such as heroism, selflessness, inspirational and transformational leadership skills, courage, grit, coolness under adversity victorious under all-weather, all-environment conditions as envisaged by Col Dalvi in his Victory India series. Not unsurprisingly, these are the very qualities acquired from reading, reflecting and deep study of the past, present and what the unknown future might offer. Not mindless application of yesterday by pretending that yesterday offers custom-made solutions for both today and tomorrow. This is the point FORCE Executive Editor Ghazala Wahab makes too, and hence the admirable synergy between these two streams of thought: one military; the other an objective appraisal by a civilian lady editor of what the military needs to do as standard, everyday, ingrained practice; not wish away this critical need as irrelevant and superfluous. 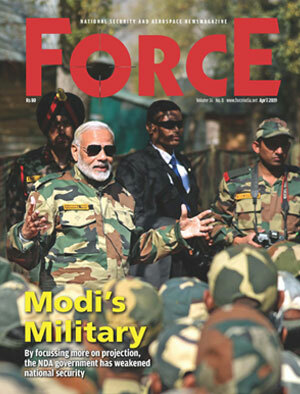 The book which has a thoughtful and far reaching Foreword by highly decorated ex-AOP Air HQ, Air Marshal Narayan Menon, is laid out in seven sections which cover the entire gamut of officer management in the military from nurturing, selection and training in Section 1 through a truly diverse coverage in the follow up sections. Col Dalvi in his path-breaking Section 1 article brings out the need for looking at Sports Medicine as an emerging, ‘must-have’ discipline in line with world trends. This is needed to ensure preventive injury protection to under-training cadets as also for professional treatment of injury once it occurs. AFMC Pune, a premier military medical college, has taken pioneering steps in this direction and Col Dalvi, who has been in touch with sports medicine developments, correctly suggests that our military training Academies apply available expertise on priority. This will undoubtedly reduce, for instance, the high incidence of stress fractures which take out a high percentage of cadets across gender in every course from the rigorous training regimen for as much as 8-10 weeks including sick leave. With a crippling existing shortage of around 13,000 officers, surely we can cut down on such losses by simply taking advantage of available skills and decentralising them to needed centres of training by placement of AFMC trained Sports Medicine experts. In the same section, another expert points at the limitations of the much-publicised DIPR-driven ‘new’ officer selection system by reducing the SSB selection process from the existing five to three days. This will make the job of the GTO, for instance, heavily stressed if not untenable and thus make a mockery of the selection system per se. Section 3 carries an article on a general tendency for risk aversion that the writer feels is creeping up in the younger lot of officers. This, he feels, is a serious liability but will happen in an environment where mindsets rule the roost. He quotes Simon Foucher who, in 1673, almost 350 years ago, had written with uncanny truth that ‘We are dogma prone from our Mother’s wombs’. Imagine carrying this attitude forward if we were to carry out a much needed surgical strike or save a colleague from lynching and certain death simply because the basic selection, training and education parameters treat dogma like a holy cow. Lt Gen. N.S. Brar in his Section 3 article on cutting military flab to promote muscle makes compelling statements. Vice Admiral Bangara in his article in Section 5 shares pragmatic views on training warriors. He is an erudite ex Commandant of the NDA who visited Australian Military Academies during his tenure and picked up important lessons on how to divide the academic-soldiering loads/responsibilities for under-training cadets rationally, pragmatically and brilliantly. These articles are penned by experienced military veterans, academics involved with military selection, training and education and by media experts reporting on this portion of military architecture. These bring out what is being done, where deficiencies have occurred, what needs correction and why and how must correction be invoked to bring the regimen of Indian military officer selection-training-education to match the best prevailing systems in the world. The book covers issues like the contours of future combat leadership; women officers in combat; doctrinal issues (our joint, overarching doctrine does not stand up to close scrutiny both inter or intra-Services besides lacking in battlefield ‘jointness’); progressive promotion policies; the choice between ragging and constructive toughening up; need for promoting “soldier-scholars” instead of just soldiers (hence accepting the criticism of inability to read, reflect and repeat as valid)…The book eloquently carries these discussions/debates. In sum, a well produced, must-read book for those engaged in military selection, training, education or in decision making positions that oversee these critical military activities including apex political authority and bureaucracy. The Victory India perspective is sufficiently germane and urgent to invite media attention in print, TV and social media platforms and thereby invite much-needed public debate on the Team Victory India to facilitate apex decision making.